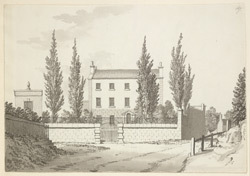 A view in ink of Hemplow House, Bath Road, Brislington, Bristol (formerly North Somerset), drawn in 1789 by S.H. Grimm. The site is the junction of Bristol Hill with Water Lane off left and Talbot Road on the right. Hemplow House was demolished to build Beeches Grove & Hawburn Close houses in 1969. The building on far right is Rose Villa, which still stands in Talbot Road.